54 Gryffe Valley 10K Run Sunday 29th April 2018 at 1.00pm Route on country lanes between Houston, Bridge of Weir and Kilmacolm, starng from Houston Public Park, for all abilies from serious runners to novices/joggers Proceeds for a Glasgow - based charity which supports research into new treatments for many of the most serious neurological conditions, including Parkinson’s, Alzheimer’s, MS, MND and brain tumours Medal, Official Time, and Goodie bag for all runners. Trophies for best males (1,2,3), best females (1,2,3), best under 18s (1,2,3), best over 60, highest sponsored individual and highest sponsored team (eg school, pub, club, company or family) for Funding Neuro. Home baking for runners and spectators! Register, meet and change at West Church Halls, Houston PA6 7EL from 11.00am. NOW is the time to make your plans: Start/ step up training, organise your team, seek sponsorship! Entry fees: £12.50 if paid in advance, £15 on the day. £5 for runners 16-17 years Follow us on Facebook - Gryffe Valley Rotary 10K Run Download Registration Form / Sponsorship Form from our website www.gryffevalley.rotary1230.org Sporting Blog by Lesley Handley Small steps to get you there Changing how you eat isn’t about making sudden sweeping changes to your lifestyle and attempting to overhaul it. It is about changing one habit at a time and repeating it often enough that it becomes easy, intuitive and effortless. Think about how you automatically brush your teeth; even if you’re half asleep you still do it. Why? ... Because it’s a habit. What if everything you needed to do to lose weight were equally automatic; not require willpower, restraint or loads of obsessive thinking and cravings. You wouldn’t worry about how long you had to keep something up, what you’re allowed to eat, or stressing if you had a holiday coming up. Like brushing your teeth, you just do them. The most common mistake people make when trying to change habits during weight loss is by thinking they can undo the habits they have had for the last 5/10/15/20 years in a couple of weeks. It isn’t going to happen. If you’ve always had a biscuit with your tea for as long as you can remember, just stopping that isn’t going to be easy. Don’t get me wrong, some people can go cold turkey and succeed, but statistics are against you. Don’t try and fine-tune the details before the big important habits are addressed. Don’t try and cut out that Rich Tea biscuit with your tea if you go out every Friday and Saturday night. Don’t try to drink nothing but water if you are used to having 4 cups of tea a day and 2 cans of coke. It is better to take smaller steps that you are confident in doing. Consider how difficult it would be for you to change something and what feels doable for you, then scale them as needed to provide a level of challenge that you feel you can consistently practice. Make a concrete plan and shrink the change, or think about what barriers you can remove or work around. Positive reinforcement hastens the formation of a habit. Lesley For more information or advice on personal training contact me on 0773 627 4925 or e-mail lesley@ fitsmartfitness.co.uk. Or visit www. fitsmartfitness.co.uk to find out about my online training system. every Mo n d a y Adult Jazz Class Bridge of Weir, 10am Tel: 01505 690757 for further information. Zumba Light St Fillan’s Church, Kilmacolm, 10am. Tel: 07505 126416 For More Information. Adult Beginners Ballet Class Bridge of Weir, 11.30am Tel: 01505 690757 for further information. Kilbarchan Athletic Club On-X, Linwood, 7pm All abilities welcome. Tel: 07941 686990. 5-a-side Football Powerleague Paisley, 6pm Tel: Jim on 01505 874215; or jimbretherton@aol.com Old Skool Step Class Freelands Church (Opposite Amaretto), 6.30pm. Tel: 07505 126416 For More Information. Bridge of Weir Ladies Badminton Cargill Hall, Lintwhite Cres, 7.30pm Callanetics Brookfield Village Hall, 7.15pm Strathgryffe Motorcycle Club The Trust Inn, Kilbarchan, 9pm - 10.30pm Visit www.strathgryffe.org for details. The Shotokan Karate Club Woodlands Primary, Linwood, 7-8pm/8-9pm www.linwoodkarate.co.uk Hatha Yoga Tweedie Halls, Linwood, 10 - 11am Classes available to all levels. Tel: 07968 207272. Pilates classes St Machars Church Hall, Bridge of Weir 9.30am & 10.40am. Kilmacolm community centre 6.30pm. Tel Yvonne 07786 224367 or yvonne@ clydephysiotherapy.co.uk Boxercise Kidston Hall, Kilmacolm, 6pm - 7pm £4 booking reqd Tel: 07983 557832 www.sifitness.co.uk the advertizer Sustrans Big Pedal 2018 Sustrans Big Pedal is the UK’s largest inter-school cycling and scooting challenge inspiring pupils, staff and parents to choose two wheels for their journey to school. Sustrans Big Pedal will run for 10 days from 23rd April to 4th May and is open to individual classes as well as whole schools. What is the challenge? On each day, schools compete to see who can record to get as many of their pupils, staff and parents cycling or scooting to school. Your school’s best five days will determine your final position, but you can log journeys on all ten days if you wish. For schools unable to take part in the main event we have a one-day challenge, which can include cycling and scooting activities in the school day as well as on the journey to school. Fundraising superhero day To celebrate the finale of the challenge there is also the option to join our superhero fundraiser day. All money raised will help us to enable thousands of children to walk, cycle or scoot every day – making the school run safer and healthier. Register now: bigpedal.org.uk Taekwon-Do Johnstone Sports Complex PA5 0LD, 6pm Call 07951 365166 for details. every Wednesday Greenock Hockey Club Inverclyde Academy, Greenock, 6.30 - 8pm Contact Liz Baldwin, mobile 07944 607005. Callanetics Brookfield Village Hall, 5.15, 6.15 & 7.30pm Hatha Yoga Large Hall, St Columba Church, 6.30 - 8pm Classes available to all levels. Tel: 07968 207272. every Th u r s d a y Kilbarchan Athletic Club On-X, Linwood, 7pm All abilities welcome. Tel: 07941 686990. Kilmacolm Walkers Birkmyre Park Pavilion, Kilmacolm, 10am David 01505 874192 kilmacolmwalkers@talktalk.net Callanetics Brookfield Village Hall, 9.15am & 10.30am The Shotokan Karate Club Woodlands PS, Linwood, 7pm & 8pm www.linwoodkarate.co.uk Football Training Johnstone High School, 6pm - 9pm Call Ali on 07775 578795 for details Taekwon-Do Johnstone Sports Complex PA5 0LD, 6pm Call 07951 365166 for details Baby Ballet Cargill Centre, Kilmacolm, Morning Call Gail Ashley on 07415 701667 for details Falun Dafa practice Port Glasgow Library 17:00 - 19:00 With five gentle exercises, Falun Dafa is an ancient self-cultivation practice based on the principles of Truthfulness, Compassion and Forbearance. every Fr i d a y Callanetics Brookfield Village Hall, 9.15am & 10.30am Adult Tap Lessons Cargill Centre, Kilmacolm, Evening Call Gail Ashley on 07415 701667 for details every Tuesday Bridge of Weir Walking Group Outside the Co-op, BoW, 10.30am 1 hour walks. Call Senga on 0141 842 3000. every Su n d a y Gryffe Badminton Strathgryffe Tennis Club, 8pm Football Training Johnstone High School, 6pm - 9pm Call Ali on 07775 578795 for details. 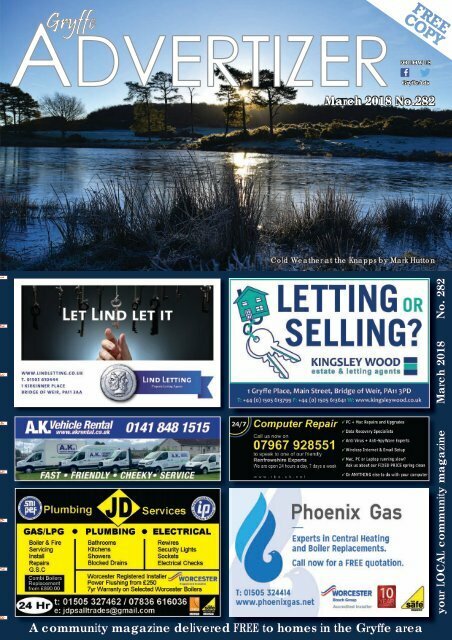 info@advertizer.co.uk 01505 613340 n Birkmyre Rugby Club, Kilmacolm Youth Rugby Section, 11am - 1pm www.pitchero.com/clubs/birkmyre deadline date for our april issue - Friday 16th March - You don’t want to miss it! !